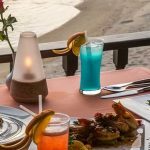 Kalim Beach has built up a reputation over the years as a must-stop address for those looking for fine dining. With fantastic views of Patong and Kalim and many up-and-coming venues to select from, this small bay is the perfect location to unwind. Just a few hundred meters north of Patong is the tiny village of Kalim that has almost been absorbed into its larger cousin next door. Fortunately the number of high quality restaurants located in there is helping the village retain its identity. 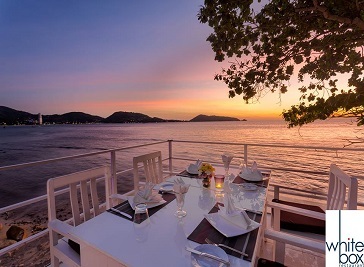 Leading the way is the iconic Baan Rim Pa with its Thai food so good that it has been served to royalty with Joe’s Downstairs and Da Maurizios right next serving high quality international cuisine. A short way down the road you will find the ever popular White Box and Aqua restaurants with Indochine just a few meters further down. The White Box Phuket offers a unique dining experience where exquisite seafood and French classics are complemented by spectacular views of Patong Bay. Our upstair terrace is a great place to enjoy sunsets and evening cocktails!